Japanese biotech startup Spiber is using genetically modified microbes to make an artificial spider silk thread – Qmonos – that is four times stronger than steel but more flexible than nylon, reports Asia Nikkei. Developed using genetic engineering and bacteria, the new artificial fiber is so strong that a 1cm diameter web would be strong enough to stop a jumbo jet during take off or landing. The scientists also validate that the material could find its way into a number of products, including clothes, medical equipment and autoparts. Researchers have for long been trying to develop technology to mass-produce a strong and flexible artificial fiber by replicating spider silk, which has long been known for its strength and elasticity. Beating rivals the world over, Spiber has achieved a world first with its mass-produced artificial spider silk. Spiber’s idea was to put spider silk to practical use by using microorganisms to mass produce spider silk proteins, and using a spinning process similar to those of chemical fibers. Microorganisms grow on nutrients that derive from sustainable biomasses, and this in turn enables Spiber to produce their silk without relying on petroleum resources. 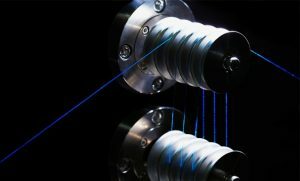 The company firmly believes that developing a process to produce spider silk on a large scale could revolutionize the worlds industries, allowing Spiber to build cars which have less impact upon collision, and to make bio absorbable surgical suture threads for the repair of minute blood vessels and nerves. Spiber’s thread, called Qmonos from the Japanese word “kumonosu” (spider web), has been so successful even in its prototype stages that it was able to net $20.9 million in fresh capital, as investors such as Shinsei Bank, bought shares through private placement. Asia Nikkei reports that it is an unusually large amount of capital to raise for a young company that has not yet started selling its products. The company was recently recognized with a Nippon Venture Award this January, being hosted by the Venture Business Creation Council. The Nippon Venture Awards are designated to acknowledge the importance of proactively accepting challenges and the social value of business entrepreneurs in general, and elevate the awareness of enterprising throughout all of society by praising and awarding business entrepreneurs who have established new enterprises that have had a strong impact and will be role models for young people. Spiber is just one of the Japanese biotech startups attracting interest from investors. Another promising player, Green Earth Institute, has developed a technology that uses microbes to convert non-food biomass into useful chemicals such as amino acids and ethanol. For the record, the biotech industry is proving an attractive investment for venture capitalists as it has the potential to produce lucrative technology. However, Japan still lags behind the U.S. and other major European countries in biotech venture capital fundraising.